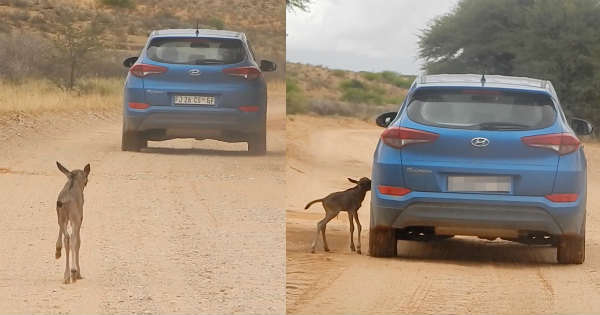 Wildebeest Calf thinks this Hyundai Tucson is its MOTHER! - Muscle Cars Zone! Wildebeest Calf thinks this Hyundai Tucson is its MOTHER! This video will melt your heart. A cute wildebeest calf runs towards the Tucson thinking that the car is its mother… Cuteness overload! Observing wild animals in their natural habitat is something utterly fascinating. We learn about their way of life, how do they behave and we see the relationships between the families. But what happens when the new and advanced man-made world interferes with nature? In the following video we see how a Wildebeest Calf gets tricked into thinking the blue Hyundai Tucson is his mother. Namely a guy driving from behind decided to film the whole situation and what he managed to capture is beautiful. The calf is seen running towards the car from the beginning of the video. The car does not seem to have noticed that so they continue to drive for quite a while. The young calf runs through muddy water just to reach the car. Shortly after, the Hyundai Tucson stopped and the Wildebeest Calf started smelling its tires. Everyone inside is delighted to have witnessed this, but it does not stop here. As the car started driving once again, the calf started running too! There is also a short clip, presumably from the Tucson, where the young calf can be seen running behind the vehicle. As it is mentioned in the video, the Wildebeest Calf ran for around 7 kilometers until the mommy spotted it and came running towards him. At the end the mommy and the calf end up going together towards the herd. This extraordinary clip shows us how innocent animals can be and how nature can sometimes be very strange. What do you think, what caused the whole situation? Please share your thoughts with us in the comment sections on this post! At last here are some interesting facts about wildebeests.